Hello, interwebs! Let me begin this post by saying that I do not have a lot of money and did not get all of these things at the same time. This is stuff that I got over the course of about two months from various stores. Also, I got all of this stuff before I went to Daiso the last time, but the pics were originally lost. With my sensitive skin, there is a lot of trial and error, mostly error, so I thought this post would still be beneficial to anyone wondering where to find skincare products for sensitive skin, how much they cost, and if they work. This Caudalie set was actually my free birthday gift from Sephora last year, but I never used it. I still haven’t tried it, but will soon because it fits into the Korean skincare routine. I only add one new product to my skin regime at a time, so I may try these in a few weeks. 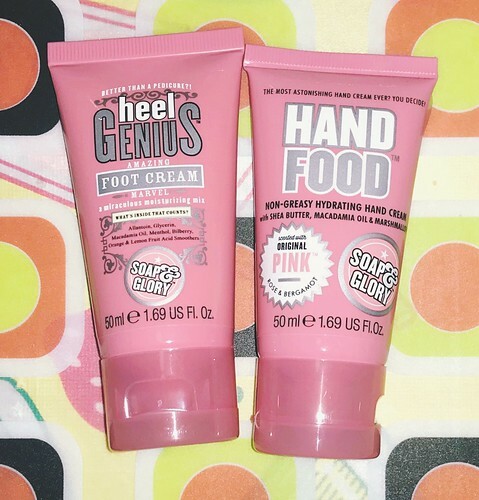 Christina gave me this gift set of Soap & Glory Heel Genius and Hand Food. The foot cream has urea, so the smell bugs me. I slather it on my feet before bed and put on socks, though, so I don’t really smell it. I really like the hand cream, even if the grape seed oil bothers my nose. It doesn’t help the eczema on my thumb and forefinger, but it doesn’t make the eczema worse either. As far as softening your skin, both products do a pretty good job. These do contain parabens and sulfates in addition to the urea, so I won’t be buying them when I finish these. I am grateful for the quick relief on my sore skin, though. They are available at Sephora, Ulta, Target, and Amazon for under $10. 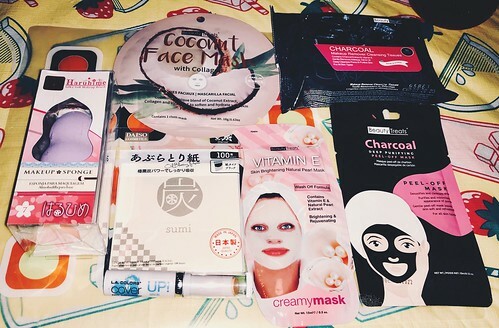 After deciding to try the Korean Skincare Routine, I figured that I should stop at Daiso. Why start with the expensive stuff if the cheap products will work? I got a beauty blender because I wanted to try it when I start working with liquid makeup. 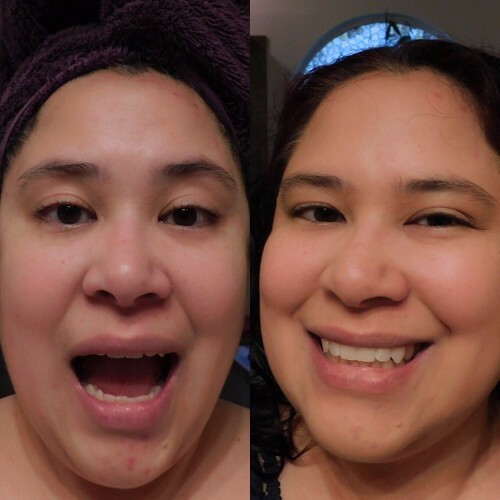 I thought it might only take a few weeks to heal my skin and then I’d move on to finding the right makeup for my skin, but I was wrong. 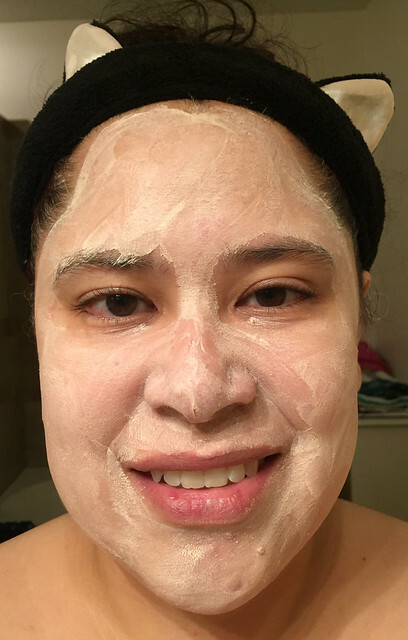 The first thing I tried was the coconut mask and it was amazing! It soothed my skin, healed some sores, and moisturized. It didn’t remove the giant pimples even though it brought them closer to the surface, making them easier to treat with other products. I use the charcoal wipes when I get home from work or any other time that my skin is itching and hurting. I start picking at my skin if I can’t soothe it, and the wipes have been good for calming my skin between washes. The concealer stick was okay. It’s the exact same color as my skin and blends easily. It doesn’t make blemishes or the circles under my eyes disappear, but it doesn’t settle in wrinkles, lines, or pores either. Most importantly, it does not break out my skin. I’ll keep using it for now, but will need to find something better later. I haven’t tried the vitamin E mask or charcoal blotting papers yet , but I’m sure they will be fine. Overall, I was surprised with how well these Daiso products worked, considering none of them was more than $3. 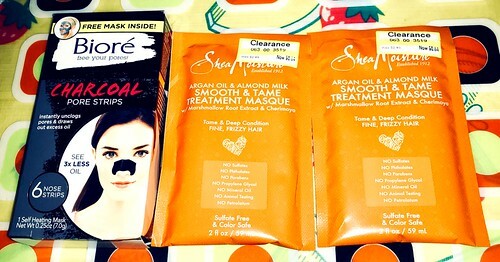 On a shopping trip at Target, I picked up some Biore Charcoal Pore Strips on sale ( box of 6 for $5.99) and Shea Moisture Smooth and Tame Treatment Masques on clearance. I’ve used Biore pore strips before, but not the charcoal strips. I think the charcoal pore strips I got at Daiso worked better than these. The other kinds of Biore strips worked better for me than these too. The box I got came with a single packet of Biore Charcoal Self-Heating One Minute Mask. 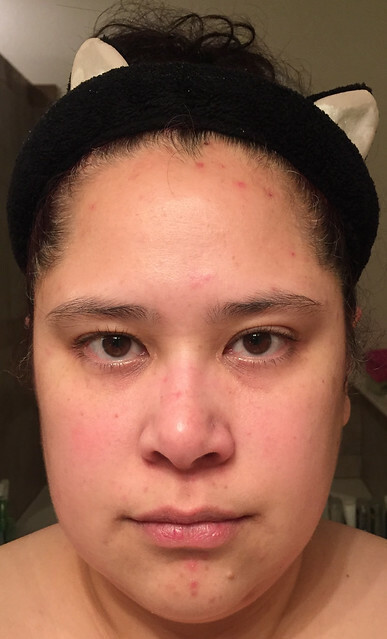 I had tried the non-charcoal mask before and liked it, but I’m not sure if the heat was good for my eczema. My face always feels clean, but soft after those masks, though. Using the masks before the strips actually works better. I think the heat opens your pores, making it easier for the strips to grab gunk from them. I haven’t tried the Shea Moisture hair treatments yet because I prefer to use them after dyeing my hair. These were on clearance for $.64 and I couldn’t pass up such a deal! The Shea Moisture packs have no sulfates, parabens, pthalates, don’t test on animals, etc. This is more like the type of beauty products I try to buy when I’m not desperate for solutions to my skin problems. 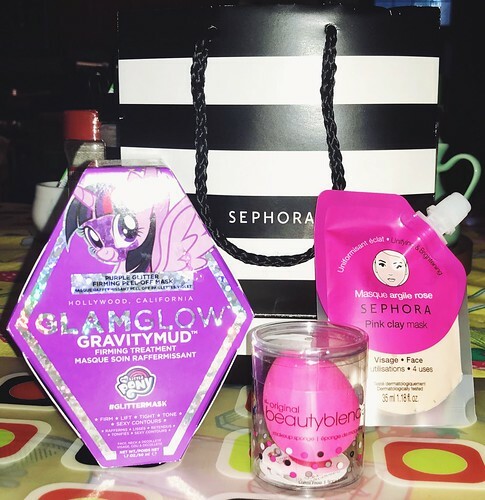 When Sephora had their VIB sale in April, I went with Christina to check out the deals. I found a Sephora Pink Clay mask that was $8 for 4 treatments. I thought the pink clay might help soothe my skin. Christina ended up buying it for me, along with “the best beauty blender on the market” and a mo fo Glam Glo Glittermask!!! I argued with her about buying all this stuff, but she said that she wanted to treat me. I have only used the pink clay mask so far, but it does a decent job of calming my skin. For all of the birthdays and holidays in May, I stopped by Marshalls to try to find some nice gifts at low prices. While there, I picked up a few things for myself. 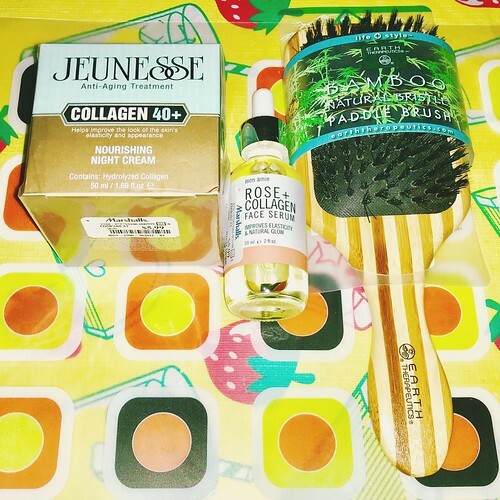 I bought the Jeunesse Anti-Aging Treatment ($5.99) and the Mon Amie Rose & Collagen Face Serum ($5.99) as items to try for moisturizing steps in my new skincare routine. Collagen is known for helping your skin retain its elasticity and rose oil is a mild moisturizer. I haven’t tried the Jeunesse moisturizer yet, but the rose & collagen serum works well and doesn’t seem to clog my pores. It also seems to calm my skin well. As much as I have loved that oil, the Earth Therapeutics Bamboo Natural Bristle Paddle Brush ($4.99) was a huge disappointment. That brush is trash! The bristles fell out on the first use and were not able to reach my scalp. I will admit that the brush did not make my hair frizzy, but I only brush my hair before I wash it (2-3 times a week). #CurlyHairGirlRules If it can’t even reach all my hair, who cares about pre-bathing frizz? I’m going to use this one on the cats. Overall, I spent less than $40 on all of the products above even though they are worth more than that. It helped that Christina bought the most important things, but she also gets to enjoy all the bonus points! Have you bought any new beauty products lately? Do you try multiple new skin products at the same time or do you tend to ease into new items? Let me know in the comments section! Do you remember going to your grandparents’ house and seeing stacks of food everywhere? My grandparents would have 12-packs of soda stashed under the counter in the kitchen. There would be boxes of dried goods packed in the pantries. The freezer was always filled with a combination of vegetables, fruits, TV dinners, and ice cream. Their fridge always had fresh milk and eggs, along with things like bologna and American cheese-filled hot dogs that I never got to eat at home. (As a kid, I felt deprived, but as an adult, I’m thankful. There were always stacks of paper towel and toilet paper rolls tucked away somewhere. My grandparents never ran out of anything. Ever. It amazed me that my grandparents’ house was always so well stocked since it was just the two of them in that house and they didn’t seem to consume much of anything that they had. At one point during my teenage years, someone told me that the type of “hoarding” that people of my grandparents’ generation did was “Depression Era Mentality”. Since then, the word “hoarding” has taken on an entirely new meaning, but Depression Era Mentality remains the same. Even though I was born decades after The Great Depression, I inherited Depression Era Mentality from my grandparents, primarily because we ran out of everything all of the time when I was growing up, so I don’t enjoy dealing with that. I am also a nice combination of poor, cheap, and Asian. So, when things are on sale that I use, I stock up like it’s going out of style. To add insult to injury, the stuff I need almost always goes on sale and has double coupons right after I ran out and had to buy more. For example, I like Method hand soap. I have eczema, so I’m really only supposed to use Cetaphil. I used to keep Cetaphil in my bathroom and Method in the guest bathroom. When I moved in with Ben, he had three kids and three bathrooms. Putting Cetaphil in all of the bathrooms in case I had to wash my hands in any of them is too expensive. Method hand soap doesn’t seem to bother my skin as much as cheaper hand soaps (i.e. Softsoap) or more expensive hand soaps (i.e. Bath and Body Works). Plus, the scents of Method hand soaps don’t bother my allergies/headaches as much as the other kinds of soap. So, we went to Target and stocked up (3 for $8). The perfect amount of soaps for a reasonable price. 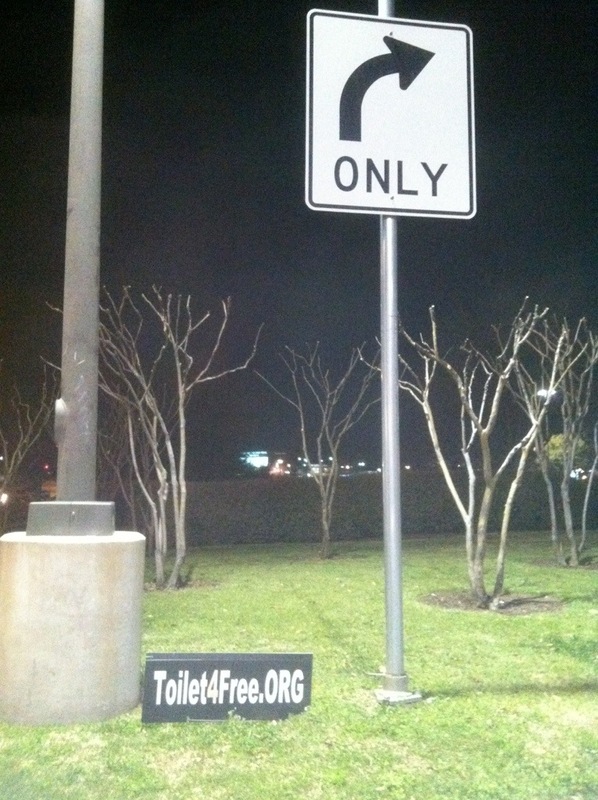 Months later, we start running out of soap in two of the bathrooms. I didn’t think about how much faster five people would go through soap than one person, so we ran out of Method hand soap. We bought some other soap to tide us over, but then it started running out in the bathroom downstairs. I finally gave in and stopped at Target to buy some Method hand soap at full price on the way home from work on a Friday. The next day, Method hand soap went on sale 3 for $8. What’s a gal in my dire state supposed to do? I revenge buy the soaps on sale to teach someone (not sure who) a lesson about being prepared. While at Target, we also partook in the four 12-packs of soda for $10 deal. I normally go through a six-pack of soda in two or three months because I mostly drink water. After some stomach bug I had recently, water irritates my stomach, especially if I drink it within two hours of going to bed. So, I have upped my consumption of coffee, tea, and soda. Even though we had just bought a 12-pack of Canada Dry ginger ale at Kroger three days earlier for around $4, I had to revenge by the four packs of soda at Target so that it’d be a good month before we had to spend $4 on soda at Kroger again. I slept very well after our trip to Target because I knew that if WWIII breaks out in the Ukraine, I could comfort myself with pleasant soaps and delicious carbonated beverages for at least a month. I’m just hoping that the war doesn’t break out before I can get the Costco membership that I have requested for my birthday. I mean, we’re making due on buying eight rolls of paper towels or 12 rolls of toilet paper at a time, but what if we need a gallon of ketchup or 80 packages of fruit snacks? Whether it’s a war or the Zombie Apocalypse, I don’t want to be the idiot that shames my grandparents’ ghosts by not staying true to Depression Era Mentality. I love me some Target, but this is just sad. I wonder how many people bought these without noticing the original price. Thursday is almost over. Where I work, Fridays are a frenzied mess of last minute antics. 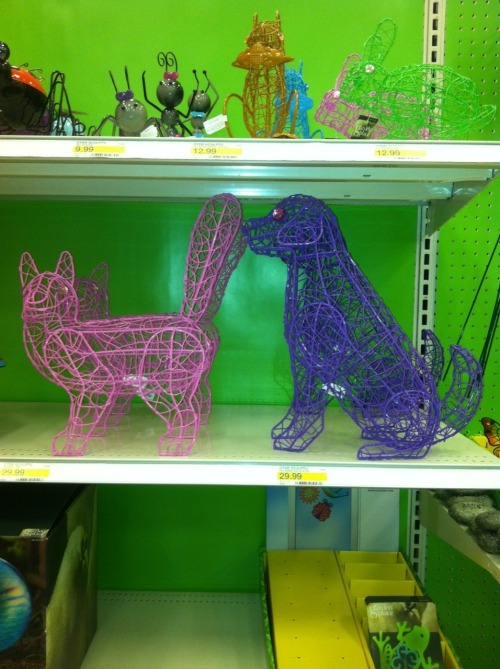 Even so, Friday means getting off work and enjoying the local sights and sounds, like this artful display outside of Target a few weeks ago.